Boston, Massachusetts is a looooong way from Melbourne, Australia. Thirty-two hours long, if you take layovers into account (and you should!). So when I lucked on the job of accompanying my son Alex there earlier this year to help him with his transition to college, my wife Sue very kindly suggested I might like to take a bit of time on the return leg, perhaps visit New York and Los Angeles, maybe catch some exhibitions and take some photographs. After giving the proposition much serious consideration (for two seconds) I was on the booking websites, and eventually four days were allocated to each city. To state it clearly – that’s four days in New York, then four days in Los Angeles, with nothing to do but take photos. I still pinch myself. Gigs don’t come much better than that. So, next thing to decide was, what camera or cameras to take, with what lenses and what film. I was attracted to the minimalist idea for a while (one of each), but then reasoned that I had the capacity to take more, and foresaw that I’d want to cover a fair bit of territory photographically, and therefore could make use of various combinations. So in the end I settled on my two M6TTLs, 28mm, 35mm, 50mm and 90mm lenses, Tri-X and Portra 160, plus I had a few rolls of Adox Silvermax that I threw in as well. So much for minimalist. Why this gear in particular? Well, my M6TTLs have different viewfinder magnifications – my silver one has a 0.58 viewfinder, the black one a 0.85. So one camera to handle 28mm and 35mm, the other perfectly suited to 50mm and 90mm. Check. The lens choice is easy because it’s basically what I generally use. I figured I’d use the 35mm most of the time, with the others in lesser proportion spread around fairly equally. I really wanted the 90mm because I envisaged some nice cityscapes in evening light, and the others are what I use mainly for people and street shooting. The film was basically dictated by what I had, and as it turned out I also had to buy some more in New York. I didn’t really anticipate that I’d use any colour in New York, but wanted some for the few pictures I thought I’d get the opportunity to take in Boston, and I figured that perhaps in LA I’d take some. So again, check. Why Leica? Very simply because I figured I’d be spending whole days in these incredible places with nothing to do but think about and pursue photography, so I wanted to take the cameras I have most fun with. No contest there – the Leicas win hands down. And with those beautiful lenses, which I often feel I don’t use enough, there really was no argument – even overcoming my initial concerns of “what if I lose some gear, or get robbed” or whatever. Plus I found I could pack that amount of gear fairly compactly into my ThinkTank Streetwalker backpack as cabin baggage, which would also enable me to get the film hand-inspected, rather than it going through x-ray machines. So, that’s the way it went down. The upshot of the trip is that, most importantly, Alex settled incredibly well into student life in Boston and loves it there (well, OK, not so much the winter weather, but still). And what of my eight glorious days in New York and Los Angeles? 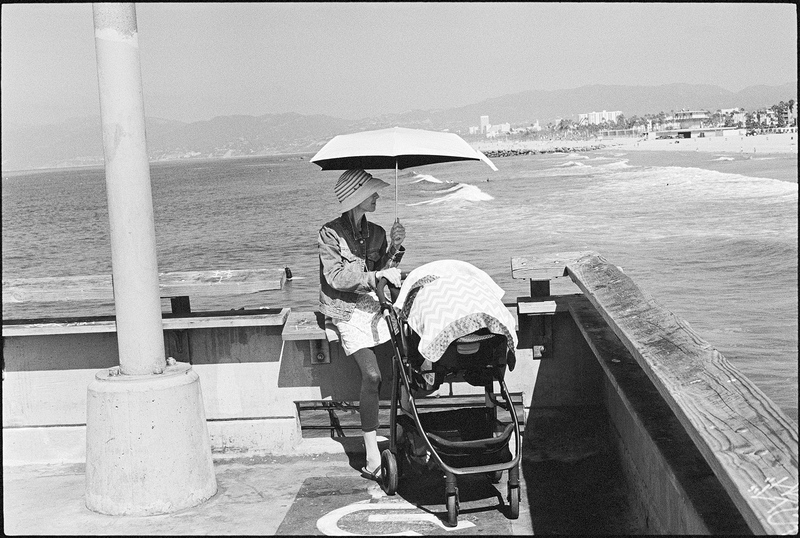 They went by in a blur of walking, subways, freeways (LA), visiting exhibitions (Danny Lyon and Diane Arbus and MOMA in New York, various architectural sites in LA) and of course, taking photographs. 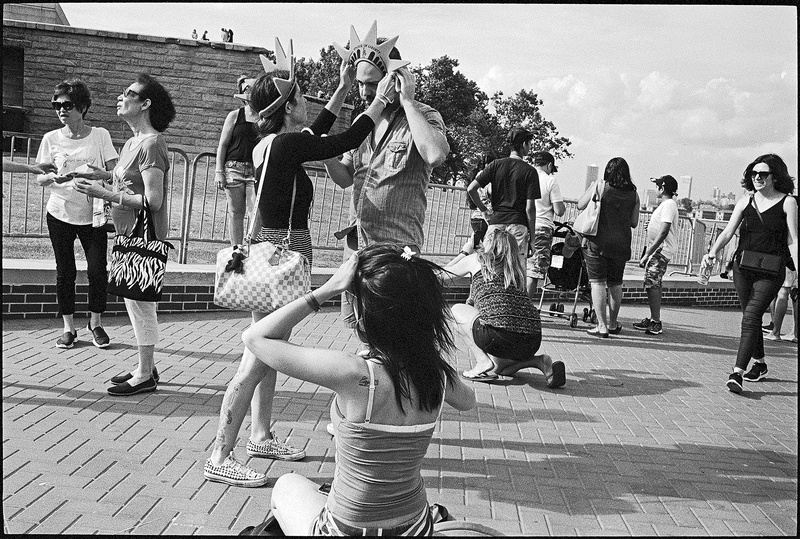 As an example, one morning I got to walk through Central Park to the Arbus exhibition at the Met Breuer, and that very afternoon found me, Leica in hand, at Coney Island where she and countless others of the greats had taken such wonderful, iconic pictures. I can’t tell you how much it meant to finally, after seeing it in great pictures my whole life, walk along that boardwalk. Overall, the pace was frenetic, and the experience was magical. At the end of each jam-packed day I was exhausted, but energized as well, and keen to be up at 5am the next day to start all over again. I was as happy as… well as a bloke who can’t think of an idiomatic expression clever enough to express it; and I think – no, I know – that I came away a better photographer because of my total immersion into it. Oh, and on my return I even sold a bunch of my other (non-Leica) gear and bought a third M6TTL, this time with a 0.72 finder, because afterwards I realized I could have gotten away with just the one camera body, and the 0.72 finder fits the bill perfectly. This entry was posted in Documentary Photography, Leica, Leica Film camera, Leica Photographers, leica street photography and tagged Philip Wright on January 8, 2017 by Leicaphila.